The girls and I are having so much fun discovering our new home before baby brother arrives in a few short weeks. We’ve met some great friends and neighbors that have really taken us under their wings and shown us so many great things in the area! This past week we adventured a bit out of our city – we’re only a short drive (a little less than an hour) from Charlottesville, VA. 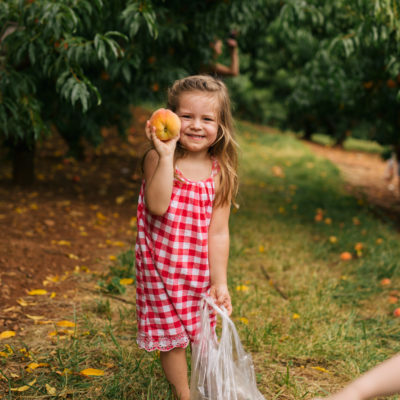 Carver Mountain Orchards is a beautiful pick-your-own-fruit farm that currently has peaches ready for picking! We came home with quite the loot and hope to make some peach jam and peach pancakes once they ripen a bit more. ;) If you’re in the area, definitely check out Carver Mountain this summer or next fall for apples!